When working with these populations it is normal at times to feel overwhelmed, anxious, angry, hopeless or dissociated. These are all common symptoms of Post Traumatic Stress (PTS). Attending to it can help it not become Post Traumatic Stress Disorder (PTSD). It is important to allow ourselves to understand that while we are not the ones directly suffering from the trauma that the people we work with are suffering, our nervous systems still often want to fight or flee. And of course we don’t listen to it. Our nervous system(s) – naturally want to escape from the overwhelming reality of being with people who are suffering so much, and this is a beautifully normal response to the work we are doing. But to deny our nervous system its normal response adds to the stress of our work. If we can have compassion for those we are working with and for ourselves, then we can begin to do much to minimize the impact on us. Maintaining conscious self-care is like creating a life jacket for ourselves while we work in the sea of trauma around us. But many helpers tell us that they need much stronger support to help them not succumb to the feelings of being overwhelmed, hopeless and becoming burnt out. Being part of a functioning intentional group can help create a human “lifeboat” in the midst of that sea; one with much more resilience then we could ever have on their own. The Polyvagal Theory has brought us a new deep and profound understanding of the nervous system and how it is impacted by stress and trauma. Here’s a simple description of what is called The Window of Tolerance. It broken down into three zones: the upper, called hyper-arousal zone, the lower, called hypo-arousal zone, and the middle, called the optimal arousal zone or zone of connection. Hyper-arousal is when the sympathetic nervous system is activated and leaves us feeling stressed, anxious, fearful, defensively or aggressively angry, and hyper vigilant. Hypo-arousal when activated leaves us feeling down, blah, depressed, hopeless and checked out or dissociated. The middle zone, the zone of optimal arousal or the zone of connection, allows us to navigate the realties of life while be able to tolerate all our emotions, from our anger to sadness, while still being able to be significantly and emotionally connected to others. When we are working with traumatized groups there are two major symptoms that will be indicators that we are in hyper or hypo arousal: 1) when we find ourselves feeling alone and disconnected from our peers and intimate others; 2) when we are not able to think clearly, literally “not in our right mind”. In hyper-arousal our focus becomes very acute and limited in focus and we can easily lose the big picture. While in hypo-arousal we can’t focus on much with any significant clarity. Both of these shifts happen in our brain chemistry due to stress. The task of our daily life, and especially during our stressful interactions, is to be able to stay in the middle zone, the zone of connection. There are many things we can do to help us keep our nervous system regulated. All of the things we do for self-care are part of it; especially things we do that directly affect the nervous system, like conscious breathing while quieting our minds. Generally though, the most effective way to stay in this zone, or to find our way back to it if we find ourselves in hyper or hypo arousal, is a meaningful connection to another human. All of us know how parents can sooth and regulate a crying child. And most of us know how good it feels to be with a caring friend or lover when we are distressed and have a meaningful connection with them. When we are working with people who are suffering from some trauma, especially groups of people suffering from a collective trauma, the quickest route back to a regulated state most often is by having meaningful connections with other people. For those of us who are therapists we know that building and supporting our clients’ capacity to let waves of emotion move through them — while finding meaningful connection – are the keys to building resilience. Likewise, even for us, the helpers, much can be done to discharge the stress and trauma we experience so that our “secondary trauma” does not turn into PTSD. Again, the two essential elements involve maintaining healthy connections and then letting ourselves have whatever emotions come up and allowing them to move through us. Considering the difficult situations we see firsthand, it’s quite natural to get angry, scared or sad, even heartbroken or overwhelmed at times. To not let these basic emotions move through us, to push them down and repress them, can often lead to our own feelings of numbness, depression, hopeless, etc. The problem is that, as helpers, it is very normal that when we listen to and witness the experiences of these traumatized people we work with we quite often deny the emotional impact on us. A deep understanding of this denial leads us to come face to face with a major component of that denial, namely shame. 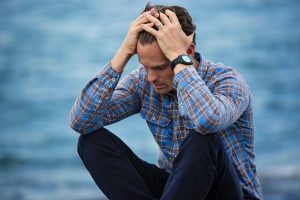 Those of us who work with people who are suffering greatly from the trauma in their lives often feel ashamed of the inner turmoil and stress it puts on us. We become ashamed to ask for help or care or soothing, ashamed to have our own emotions when what we are experiencing often feels so minor compared to those we are helping. But our nervous systems do not agree. Our nervous system does not care about comparing itself to anyone else’s. Our nervous system is trying to tell us to listen to our own experience and will tell us exactly what attention is needed, what emotions we are experiencing and needed to let move through us. And we know that this would greatly help us feel not only personal relief, it would also allow us to become more regulated and return to the zone of connection. As we learn to do this regularly for ourselves, we will naturally have more to bring to the work we do. We know that close intimate connection with our loved ones can be soothing and healing. Yet we also know that, for many reasons, it is not always easily accessible in our work with traumatized groups. But a very powerful source of healing through connection is often right in our very midst: in the peer group we are working with. Finding the compassion to listen to our own needs in a supportive group where others are doing the same is how we build resilience. By having a significant emotional connection with the group and with specific members will allow us to lean into our emotions and let the waves move through us more readily. Be it a health clinic, a relief agency, an aid group, or any group of volunteers, activists, or professionals working together to help traumatized populations, the potential for the group to be a significant part of maintaining good mental health, the building of resilience, and even healing is present. To create a healthy, functioning and intentional group you can start by taking a short amount of time on a regular basis to bring the group together to do a guided meditation or ritual with an explicit focus on an embodied connection between the group members. And by “embodied connection” I mean by asking them to find the actual sensations in their body of the connection with others. And then by focusing on the shared intention and goodness of the group you can bypass any personality conflicts that are often common in our groups. Trauma gets into our body. It impacts our nervous system and then spreads out to affect our thinking and physiology, and significantly impacts our emotions. So we need to start with the body to build resilience. We also need to feel enough of a connection with our peers so at the end of the day or week, when we know we need to move through some grief or sorrow or anger having to do with our work with the traumatized population we are serving, we have a place to turn where we know we will be seen and met. This connection, be it from an individual peer or the group itself, can let the waves of emotion that want to move through us do just that. This often untapped resource can become available to us by building a strong foundation of group consciousness through forming and maintaining group support for each member, essentially creating a human lifeboat in addition to individual life jackets for these rough seas. If we can, as a group, hold onto the shared goal, hold onto the natural need for verbal articulation and emotional release for the issues that affect us personally — and can remind each other, ask each other, and check in with each other — this will normalize the need for deep connection and help us let the emotional impact of working with these populations move through us. We are all doing this work because of our passion to help those who are suffering. We want to stay clear-headed, open-hearted and able to be fully human in our work. And we don’t want this work to cost us our own mental health or our own intimate relationships away from work. Understanding stress and trauma and its impact on the nervous system isn’t just for our clients. We, as helpers, need to stay connected to others so things can “move through us”. Being an active part of a supportive group can go a long way to meeting that goal. Alleviating suffering in ourselves will not only serve our personal nervous systems and our personal lives, it will also serve our clients and the groups we work with. This is a great handout to help you understand the Window of Tolerance and gives you many techniques to help you get your nervous system regulated by yourself, how to build and maintain your personal lifejacket. She does not speak to using relationships, but these are all things you can do on your own.